"Alleyway" redirects here. For the videogame, see Alleyway (video game). For the surname, see Alley (surname). An alley or alleyway is a narrow lane, path, or passageway, often reserved for pedestrians, which usually runs between, behind, or within buildings in the older parts of towns and cities. It is also a rear access or service road (back lane), or a path, walk, or avenue (French allée) in a park or garden. 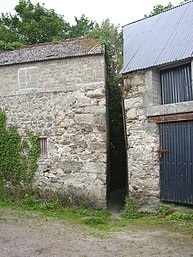 (1) It can refer to a narrow, usually paved, pedestrian path, often between the walls of buildings in towns and cities. This type is usually short and straight, and on steep ground can consist partially or entirely of steps. (a) A rear access or service road (back lane), which can also sometimes act as part a secondary vehicular network. Many Americans and Canadians think of an alley in these terms first. (b) A narrow street between the fronts of houses or businesses. This type of alley is found in the older parts of many cities, including American cities like Philadelphia and Boston (see Elfreth's Alley, Philadelphia, Pennsylvania). Many are open to traffic. In landscaping, an allée or avenue is traditionally a straight route with a line of trees or large shrubs running along each side. In most cases, the trees planted in an avenue will be all of the same species or cultivar, so as to give uniform appearance along the full length of the avenue. The French term allée is used for avenues planted in parks and landscape gardens, as well as boulevards such as the Grand Allée in Quebec City, Canada, and Karl-Marx-Allee in Berlin. Because of geography, steps (stairs) are the predominant form of alley in hilly cities and towns. This includes Quebec City in Canada and in the United States Pittsburgh (see Steps of Pittsburgh), Cincinnati (see Steps of Cincinnati), Minneapolis, Seattle, and San Francisco as well as Hong Kong, Genoa and Rome. Arcades are another kind of covered passageway and the simplest kind are no more than alleys to which a glass roof was added later. Early examples of a shopping arcades include: Palais Royal in Paris (opened in 1784); Passage de Feydeau in Paris (opened in 1791). Most arcades differ from alleys in that they are architectural structures built with a commercial purpose and are a form of shopping mall. All the same alleys have for long been associated with various types of businesses, especially pubs and coffee houses. Bazaars and Souqs are an early form of arcade found in Asia and North Africa. The Burlington Arcade (1819) was one of London's earliest covered shopping arcades. It was the successful prototype for larger glazed shopping arcades, beginning with the Saint-Hubert Gallery (1847) in Brussels and The Passage (1848) in St Petersburg, the first of Europe's grand arcades, to the Galleria Umberto I (1891) in Naples, the Galleria Vittorio Emanuele II in Milan (1867), and the Block Arcade, Melbourne, Australia (1893). Some historic alleys are found in older American and Canadian cities, like New York City, Philadelphia, Charleston, South Carolina, Boston, Annapolis, New Castle, Delaware, Quebec City, St John's, Newfoundland, and Victoria, British Columbia. Québec City was originally built on the riverside bluff Cap Diamant in the 17th century, and throughout Quebec City there are strategically placed public stairways that link the bluff to the lower parts of the city. The Upper City is the site of Old Québec’s most significant historical sites, including 17th- and 18th-century chapels, the Citadel and the city ramparts. The Breakneck Stairs or Breakneck Steps (French: Escalier casse-cou), Quebec City's oldest stairway, were built in 1635. Originally called escalier Champlain "Champlain Stairs", escalier du Quêteux "Beggars' Stairs", or escalier de la Basse-Ville "Lower Town Stairs", they were given their current name in the mid-19th century, because of their steepness. The stairs have been restored several times, including an 1889 renovation by Charles Baillargé. Several residential neighborhoods in Austin, Texas, have comprehensive alley systems. These include Hyde Park, Rosedale, and areas northwest of the Austin State Hospital. There are also numerous alleys downtown, particularly in the 6th Street district, where bars and restaurants place their garbage for collection. New York City's Manhattan is unusual in that it has very few alleys, since the Commissioner's Plan of 1811 did not include rear service alleys when it created Manhattan's grid. The exclusion of alleys has been criticized as a flaw in the plan, since services such as garbage pickup cannot be provided out of sight of the public, although other commentators feel that the lack of alleys is a benefit to the quality of life of the city. Since there are so few alleys in New York, film location shooting requiring alleys tend to be concentrated in Cortlandt Alley, located between Canal and Franklin Streets in the blocks between Broadway and Lafayette Street in the TriBeCa neighborhood of lower Manhattan. Two notable alleys in the Greenwich Village neighborhood in Manhattan are MacDougal Alley and Washington Mews. The latter is a blind alley or cul-de-sac. Greenwich Village also has a number of private alleys that lead to back houses, which can only be accessed by residents, including Grove Court, Patchin Place and Milligan Place, all blind alleys. Patchin Place is notable for the writers who lived there. In the Brooklyn Heights neighborhood of Brooklyn, Grace Court Alley is another converted mews, as is Dennett Place in the Carroll Gardens neighborhood. The former is a cul-de-sac. Shubert Alley is a 300-foot (91 m) long pedestrian alley at the heart of the Broadway theater district of New York City. The alley was originally created as a fire exit between the Shubert Theatre on West 45th Street and the Booth Theatre on West 44th Street, and the Astor Hotel to their east. Actors once gathered in the alley, hoping to attract the attention of the Shubert Brothers and get employment in their theatrical productions. When the hotel was torn down, and replaced with One Astor Plaza (1515 Broadway), the apparent width of the alley increased, as the new building did not go all the way to the westernmost edge of the building lot. However, officially, Shubert Alley consists only of the space between the two theatres and the lot line. There are over 600 publicly accessible stairways within Seattle, a city of hills, bluffs, and canyons. For an example see Howe Street Stairs. Numerous cities in the United States and Canada, such as Chicago, Seattle, Los Angeles, Phoenix, Washington, D.C., and Montréal, have started reclaiming their alleys from garbage and crime by greening the service lanes, or back ways, that run behind some houses. Chicago, Illinois has about 1,900 miles (3,100 km) of alleyways. In 2007, the Chicago Department of Transportation started converting conventional alleys which were paved with asphalt into so called Green Alleys. This program, called the Green Alley Program, is supposed to enable easier water runoff, as the alleyways in Chicago are not connected directly to the sewer system. With this program, the water will be able to seep through semi-permeable concrete or asphalt in which a colony of fungi and bacteria will establish itself. The bacteria will help breakup oils before the water is absorbed into the ground. The lighter color of the pavement will also reflect more light, making the area next to the alley cooler. The greening of such alleys or laneways can also involve the planting of native plants to further absorb rain water and moderate temperature. In 2002, a group of Baltimore residents from the Patterson Park neighborhood approached the Patterson Park Community Development Corporation (CDC) looking for a way to improve the dirty, crime-ridden alley that ran behind their homes. Simultaneously, Community Greens also approached the Patterson Park CDC looking for an alley they could use as a pilot project in Baltimore. This led The Luzerne-Glover block being granted a temporary permit from the city to gate their alleyway, despite the fact that it was not yet legal to gate a right-of-way. Eventually the law was changed so that Baltimore residents could legally gate and green the alleys behind their homes. In the same neighbourhood Cecil Court has an entirely different character than the two previous alleys, and is a spacious pedestrian street with Victorian shop-frontages that links Charing Cross Road with St Martin's Lane, and it is sometimes used as a location by film companies. In East Sussex, West Sussex and Surrey, "twitten" is used, for "a narrow path between two walls or hedges". It is still in official use in some towns including Lewes, Brighton, and Cuckfield. "Loughton also has twittens, the only Essex example of use of the word and an indication of a very old street pattern"; Loughton also has a track known locally as "The Widden", a variant of twitten. In north-west Essex and east Hertfordshire "twichell" is common. In other parts of Essex, alley or path is used. In the city of Brighton and Hove (in East Sussex), The Lanes is a collection of narrow lanes famous for their small shops (including several antique shops) and narrow alleyways. The area was part of the original settlement of Brighthelmstone, but The Lanes were built up during the late 18th century and were fully laid out by 1792. In Plymouth, Devon an alley is an "ope". More generally in Devon any narrow public way which is less commodious than a lane may be called a "drangway" (from "drang", as a dialectal variation of throng); typically it will be used on horseback or on foot with or without animals, but may also be for occasional use with vehicles. The word, according to David Crystal, is also used throughout the West of England, Wiltshire, Hampshire and the Isle of Wight, as well as Wales. In Derbyshire and Leicestershire the word "jitty" or "gitties" is often found  and "gulley" is a term used in the Black Country. In Nottinghamshire, "twichell" is common (See East Midlands English). In Shropshire (especially Shrewsbury) they are called "shuts". The Snickelways of York, in York, Yorkshire, often misspelt "snickleways", are a collection of small streets, footpaths, or lanes between buildings, not wide enough for a vehicle to pass down, and usually public rights of way. York has many such paths, mostly mediaeval, though there are some modern paths as well. They have names like any other city street, often quirky names such as Mad Alice Lane, Nether Hornpot Lane and even Finkle Street (formerly Mucky Peg Lane). The word "snickelway" was coined by local author Mark W. Jones in 1983 in his book A Walk Around the Snickelways of York, and is a portmanteau of the words "snicket'", meaning a passageway between walls or fences, "ginnel", a narrow passageway between or through buildings, and "alleyway", a narrow street or lane. Although a neologism, the word quickly became part of the local vocabulary, and has even been used in official council documents. In Whitby, North Yorkshire "ghauts". In Scunthorpe, Lincolnshire, Goole and Hull, East Riding of Yorkshire other terms in use are "cuttings", "8-foots", "10-foots", and "snicket". In North Yorkshire and County Durham, as in Scotland, an alley can be a "wynd". There is a "Bull Wynd" in Darlington, County Durham and Lombards Wynd in Richmond, North Yorkshire. In north-east England, including Bishop Auckland, County Durham; Durham; Hexham, Northumberland; Morpeth, Northumberland; Whitburn, South Tyneside; and Newcastle upon Tyne, Northumberland, alleys can be called "chares". The chares and much of the layout of Newcastle's Quayside date from medieval times. At one point, there were 20 chares in Newcastle. After the great fire of Newcastle and Gateshead in 1854, a number of the chares were permanently removed although many remain in existence today. Chares also are still present in the higher parts of the city centre. According to "Quayside and the Chares"  by Jack and John Leslie, chares reflected their name or residents. "Names might change over the years, including Armourer's Chare which become Colvin's Chare". Originally inhabited by wealthy merchants, the chares became slums as they were deserted due to their "dark, cramped conditions". The chares were infamous for their insanitary conditions – typhus was "epidemic" and there were three cholera outbreaks in 1831-2, 1848–9 and finally in 1853 (which killed over 1,500 people). In Manchester and Oldham, Greater Manchester, as well as Sheffield, Leeds and other parts of Yorkshire, "jennel", which may be spelt "gennel" or "ginnel", is common. In some cases, "ginnel" may be used to describe a covered or roofed passage, as distinct from an open alley. In Liverpool, Merseyside, the terms "entry", "jigger" or "snicket" are more common. "Entry" is also used in some parts of Lancashire and Manchester, though not in South Manchester. This usually refers to a walkway between two adjoining terraced houses, which leads from the street to the rear yard or garden. The term entry is used for an alley in Belfast, Northern Ireland (see The Belfast Entries). In Scotland and Northern Ireland the Scots terms close, wynd, pend and vennel are general in most towns and cities. The term close has an unvoiced "s" as in sad. The Scottish author Ian Rankin's novel Fleshmarket Close was retitled Fleshmarket Alley for the American market. Close is the generic Scots term for alleyways, although they may be individually named closes, entries, courts and wynds. Originally, a close was private property, hence gated and closed to the public. In Australia and Canada the terms lane, laneway, right-of-way and serviceway are also used. In some parts of the United States, alleys are sometimes known as rear lanes or back lanes because they are at the back of buildings. In parts of Canada, Australia and the United States, mews, a term which originated in London, England, is also used for some alleys or small streets (see, for example, Washington Mews in Greenwich Village, New York City). In the Netherlands the equivalent term is steeg. Cities such as Amsterdam have many stegen running between the major streets, roughly parallel to each other but not at right angles to the streets. See. In Belgium the equivalent term is gang (Dutch) or impasse (French). Brussels had over 100 gangen/impasses, built to provide pedestrian access to cheap housing in the middle of blocks of buildings. Since 1858, many have now been demolished as part of slum clearance programmes, but about 70 still exist. The French allée meaning avenue is used in parts of Europe such as Croatia and Serbia as a name for a boulevard (such as Bologna Alley in Zagreb). The Swedish word "allé" and the German word "Allee", are also based on this French allée (such as Karl-Marx-Allee in Berlin). In France, the term allée is not used as the actual word is ruelle, which is described as, "an alley between buildings, often accessible only to pedestrians. These streets are found especially in old city neighbourhoods, particularly in Europe and in the Arab-Muslim world". Passage and sentier (path) are also used. Czech and some other Slavic languages use the term "ulička" (little street) for alley, a diminutive form of "ulice", the word for street. In Montréal, Canada ruelle (diminutive of French rue, a street) is used for a back lane or service alley. There has been an endeavour to green these and some are quite attractive. In the Philippines, a common term is eskinita, and refers to any small passage not considered a street between two buildings, especially in shantytowns. The term is ultimately derived from the diminutive of the Spanish word esquina, meaning "corner". The common Italian word for an alley is vicolo. Venice is largely a traffic free city and there is, in addition to the canals, a maze of around 3000 lanes and alleys called calli (which means narrow). Smaller ones are callètte or callesèlle, while larger ones are calli large. Their width varies from just over 50 centimetres (19.7 in) to 5–6 metres (196.9–236.2 in). The narrowest is Calletta Varisco, which just 53 centimetres (20.9 in); Calle Stretta is 65 centimetres (25.6 in) wide and Calle Ca’ Zusto 68 centimetres (26.8 in). The main ones are also called salizada and wider calli, where trade proliferates, are called riga, while blind calli, used only by residents to reach their homes, are ramo. In typography, alley is also used to refer to the gap between two columns of text. A bowling alley is a building where the game of bowling is played. ^ Sassatelli, R., Consumer Culture: History, Theory and Politics, Sage, 2007, p. 27. ^ "Québec City and Area - Stairways". Québec City Tourism. 2011. Archived from the original on 9 February 2011. Retrieved 15 February 2011. ^ Fahrenthold, David A. "Celebrating Annapolis's Storied Shortcuts". The Washington Post (27 January 2005) p.AA14. ^ Poston, Jonathan H. The Buildings of Charleston: A Guide to the City's Architecture. Columbia, SC, University of South Carolina Press, 1997, pp.136–7. ^ "City of seven hills". The Cincinnati Enquirer. 4 December 2008. Retrieved 17 May 2013. ^ "Walking the Steps of Cincinnati — 1998". Ohio University Press & Swallow Press. Retrieved 17 May 2013. ^ Devin Parrish (January 1998). "Observer: Climb Every Hill". Cincinnati Magazine. p. 22. Retrieved 17 May 2013. ^ Rosenberg, Joe (8 January 2019). "Cortlandt Alley". 99% Invisible. Retrieved 14 January 2019. ^ Elfreth's Alley Association website. ^ "Pyle's Great Column on Pittsburgh". Pittsburgh Press. 19 April 1945. ^ The location of Filbert Street in San Francisco, Google Maps. ^ Sam Whiting (30 June 2006). "The limited confines of San Francisco's French Quarter don't make it any less foreign". San Francisco Chronicle. Archived from the original on 1 January 2007. Retrieved 2007-06-23. ^ Seattle All Stairs: "Archived copy". Archived from the original on 30 May 2014. Retrieved 1 May 2014. CS1 maint: Archived copy as title (link). ^ For examples see Louis Zettersen, City Street Names (London: privately published, 1926): , and more up-to-date Londonist's Back Passages: . ^ John Biddulph Martin, "The Grasshopper" in Lombard Street, New York, Scribner & Welford (1892). ^ J. Pelzer and L. Pelzer, "Coffee Houses of Augustan London," History Today, (October, 1982), pp. 40–47. ^ John Biddulph Martin, "The Grasshopper" in Lombard Street, New York, Scribner & Welford (1892), p. 207. ^ Urban 75 web page, London Walk 5: Brydges Place; "London's narrowest alley": . ^ "The Lamb and Flag". Pubs.com. Retrieved 30 July 2010. ^ F. H. W. Sheppard (1970). Survey of London: volume 36: Covent Garden. Institute of Historical Research. pp. 182–184. Retrieved 30 July 2010. ^ John Richardson (2000). The Annals of London. University of California Press. p. 156. ISBN 978-0-520-22795-8. Retrieved 30 July 2010. ^ "John Wilmot, 2nd Earl of Rochester". Encyclopædia Britannica. XXIII (11th ed.). Cambridge University Press. 1910. p. 428. Retrieved 2 August 2010. ^ "January 2007 - Cecil Court". Film London. Retrieved 5 August 2014. ^ "Filming in Cecil Court | thelastbookshop". Thelastbookshop.wordpress.com. 24 May 2011. Retrieved 5 August 2014. ^ "Lingfield villagers seek plastic bag-free zone". BBC. 7 May 2012. Retrieved 1 January 2014. ^ Loughton & District Historical Society Newsletter 136, April 1997. ^ "A History of Brighton". Localhistories.org. Retrieved 5 August 2014. ^ Mary Palmer, A dialogue in the Devonshire dialect, by a lady [M. Palmer]: to which is added a glossary, by J.F. Palmer, 1837. ^ The Disappearing Dictionary: A Treasury of Lost English Dialect Words. Pan Macmillan,2015. ^ "History and Language in Oldbury, Worcestershire". Posted on 19 May 2012 . See also: David Wilson, Staffordshire Dialect Words: A Historical Survey. Moorland Publishing Company, 1974. ^ geograph: "Shrewsbury's shuts and passages"
^ The Wynd (1 January 1970). "wynd richmond - Google Maps". Google Maps. Retrieved 5 August 2014. ^ Harris, S (1996). The Place Names of Edinburgh. London: Steve Savage. p. 28. ISBN 1 904246 06 0. ^ Town and Regional Planning Programme, University of Dundee. "Conservation Glossary, entry for "pend"". Archived from the original on 12 February 1997. Retrieved 12 May 2008. ^ "Rights-of-Way or Laneways in Established Areas- Guidelines" (PDF). Planning Bulletin No 33. Western Australian Planning Commission. July 1999. Retrieved 4 October 2012. ^ "Stegen in Amsterdam". Studiokoning.nl. Retrieved 5 August 2014. ^ French Wikipedia article, Google translation (edited). ^ "slovnik.seznam.cz Translation of "ulička"". Retrieved 18 February 2010. ^ Spacing Montreal, "Montrea's Best Alleyways": . ^ a b "Tourismus-Reutlingen: An eye of a needle with world fame". Wirtschaft-Necker Alb. Retrieved 5 February 2010. ^ Glenday, Craig, ed. (2009). Guinness World Records 2009. Random House Publishing Group. p. 493. ISBN 978-0-553-59256-6. ^ "Regio-Report Neckar-Alb Aus der Region" (in German). E-Paper – Wirtschaft-Neckar Alb. April 2007. Archived from the original on 19 July 2011. Retrieved 6 November 2010. ^ a b "Mårten Trotzig (1559–1617)". Swedish Wikipedia. 11 November 2006. Retrieved 18 January 2007. Reference: Stahre, Nils-Gustaf; Fogelström, Per Anders & Ferenius, Jonas & Lundqvist, Gunnar (2005) . Stockholms gatunamn (utgåva 3:e upplagan). Stockholm: Stockholmia förlag. Libris 10013848. ISBN 91-7031-152-8. ^ a b "Innerstaden: Gamla stan". Stockholms gatunamn (2nd ed.). Stockholm: Kommittén för Stockholmsforskning. 1992. p. 62. ISBN 978-91-7031-042-3. ^ Michael Meyer. "The Death and Life of Old Beijing". ^ Kane, David (2006). The Chinese Language: Its History and Current Usage. Tuttle Publishing. p. 191. ISBN 978-0804838535. Retrieved 10 October 2012. ^ "Architectural Record | McGraw-Hill Construction". Archrecord.construction.com. 5 October 2011. Retrieved 5 August 2014. ^ Robert Booth and Jonathan Watts, "Charles takes on China to save Ming dynasty" The Guardian, Thursday 5 June 2008: . Accessed 15 January 2014. ^ Beijing Hutong: "Archived copy". Archived from the original on 16 January 2014. Retrieved 15 January 2014. CS1 maint: Archived copy as title (link). ^ Frommer's Shanghai Day By Day - Page 162 Graham Bond - 2011 1912 "1917 China's first shopping mall, the Sincere Department Store, Lilong, or Longtang Li means "neighborhood," and long means "alley."" ^ Postsocialism and Cultural Politics: China in the Last Decade of ... - Page 196 Xudong Zhang - 2008 "As long means a lane and tang the front room of a house, longtang either refers to a lane that connects houses or a group of houses connected by lanes. Longtang however might not be so explicit as lilong for the li in lilong means ..."
^ Narrating Architecture: A Retrospective Anthology Page 474 James Madge, Andrew Peckham - 2006 "Four sketches by Feng Zikai of Shanghai's alley life: clockwise from top left: lowering a basket down to the alley to purchase ... these activities were certainly not considered in the original design of the lilong, but were gradually introduced in the practice of everyday life within the community. A local writer, Shen Shanzeng, has named this special way of living as 'life in the alley' (long-tang ren-sheng)." ^ "Medina definition". Oxford English Dictionary. ^ "7 car-free cities". Mother Nature Network. ^ Typographical definition of "Alley"
DuSablon, Mary Anna, Walking the Steps of Cincinnati. Athens, OH. : Ohio University Press, 1998. Hage, Sara A., Alleys: Negotiating Identity in Traditional, Urban, and New Urban Communities. M.A. Thesis, University of Massachusetts, Amherst, 2008. Long, David, Hidden City: The Secret Alleys, Courts & Yards of London's Square Mile. London: The History Press, 2011. Regan, Bob, The Steps of Pittsburgh: Portrait of a City. Pittsburgh, PA.: The Local History Company, 2004. 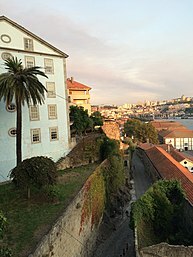 Wikimedia Commons has media related to Alleys.